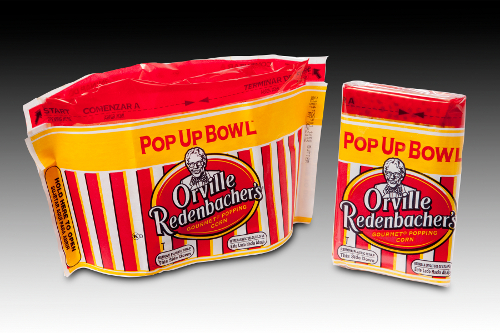 2012 FPA Highest Achievement Award winner: Orville Redenbacher Popcorn Pop Up Bowl converted by Phoenix Packaging for ConAgra Foods. The 2012 Flexible Packaging Assn. annual meeting held last week in Scottsdale, AZ, was not even 48 hrs long, but it was packed with informative presentations to help the nearly 300 industry professionals on hand stay flexible amid the continuing US economic recovery. A highlight of the program is always the group’s Achievement Awards, and this year’s winners didn’t disappoint. Click HERE to read about the 2012 honorees. In typical Converting Curmudgeon fashion, here’s a series of bullet points as take-aways. 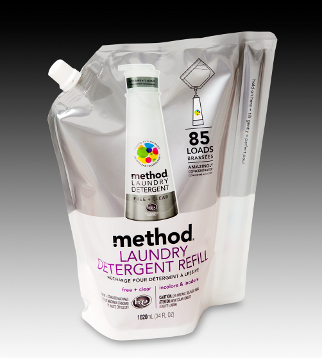 2012 Gold Award for Technical Innovation: Method laundry detergent standup pouch converted by Innovative Packaging Solutions, Inc.
2012 US flexible-packaging sales will reach $26.6 billion, up 4.5% over 2011. Profits will be flat as volumes get higher. This growth is double the 2.2% increase being forecasted for overall US GDP growth. The 2001-11 CAGR for the US flex-pack industry was 2.7%. There were 405 converting companies last year, 950 manufacturing facilities and 79,000 employees. A percentage breakdown of 2011 manufacturing costs/expenses shows materials (58%), direct labor (10%), sales/marketing/administration/R&D (10%), all other (18%). Before-tax profit was 4%. Leading market opportunities include the continuing conversion from rigid containers to flexible packaging; the sustainability advantages of flex packs (source reduction, lightweighting, recycled/recyclable materials); ongoing industry innovation; emerging markets; and the overall US economy slowly climbing out of The Great Recession. Top challenges listed by FPA members: Raw-material cost volatility; concerns about US/world economy; skilled labor availability; consolidation; and green initiatives. The US flex-pack field continues to shift toward being one of either very large or small companies. Since 1996, the percentage of converters with annual sales over $500 million has grown from 28% to 47%, while the share of mid-size converters with sales between $50-$500 million has fallen from 47% to 32%. As the US economy has begun to recover, flex-pack imports are rebounding as exports are falling. In 2010, China accounted for 39% of the $3.2 billion of product imported; Canada made up 39% of the $1.5 billion of product that was exported. 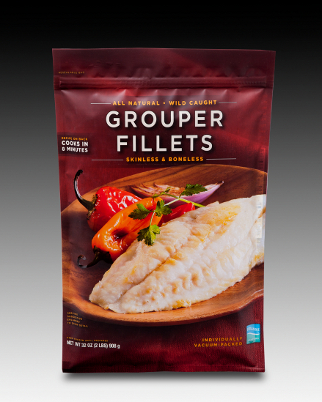 2012 Gold Award for Printing Achievement: Icelandic Grouper Fillets resealable pouch converted by Flex-Pack. 2011 flex-pack sales across Europe were €11.6 billion in 2011, with 83% of sales in Western Europe (€9.65 billion). European flex-pack sales grew 5.5% over 2010, with Western Europe up 5% and Eastern Europe up 8%. Most of the value increase was due to escalating raw-material costs, which were mainly recovered in higher prices to customers. On a national basis, the highest growth in value terms: Russia (9%) and Turkey (7%). Not surprisingly, Greece, Spain and Portugal saw declines. For the short term (Q1 2012), FPE members foresee raw-material prices falling while sales volumes and profits will rise. Over H1 2012, capacity utilization will remain flat. Europe’s top 10 flex-pack converters (Amcor, Constantia, Sealed Air-Cryovac, Clondalkin Group, WIPAK, Mondi Packaging, Huhtamaki, Bemis, Südpack and Bischof & Klein) account for 53% of the total industry. Production notes: Some leading converters are losing market share to smaller companies, and flexography is making headway in some gravure-dominated markets. 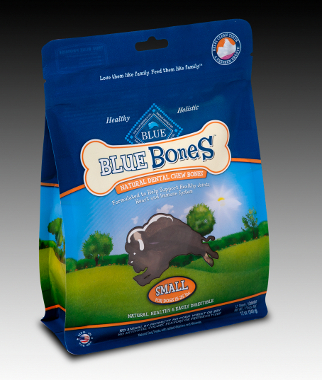 2012 Gold Award for Packaging Excellence, Printing Achievement and Technical Innovation: Blue Bones dog-treats standup pouch converted by Plastic Packaging Technologies, LLC. Worldwide flex-pack industry is valued at about US$68 billion or 15% of the overall global packaging market. The 2005-2010 CAGR for global flex packs was 5%. US flex-pack field, which is growing faster than the paper/packaging industry in general, makes up 39% of the global flex-pack total. Many large converters are diversified with significant non-flexible operations. The global flex-pack industry remains fragmented and more competitive than the rigid-packaging segment. As such, there is likely room for additional consolidation. The top 10 US converters account for nearly half of industry revenues. Continued struggles with EU sovereign debt will impact flex-pack converters with European exposure. Eurozone growth will be negative through Q3 2012. Better economic times in emerging markets will drive flex-pack converter growth. Demand for packaged food and other products will increase as a result of a growing middle class, increased protein consumption and food safety. 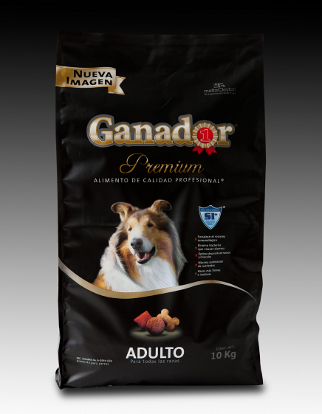 2012 Gold Award for Printing Achievement: Ganador Premium dog-food QuadSeal Sack converted by Printpack. The US flex-pack market will climb 4.2% a year, reaching $30.1 billion in 2015. Flexibles will take over another percent of the total US market versus rigid containers, hitting 18.7% in 2015. Improvements in technology since 2002 have enabled plastic film and sheet sales to grow well (5.1% CAGR) relative to that of plastic bags (2.2%), corrugated board (1.1%), glass bottles (2.4%) or aluminum foil packaging (-6.0%). Flexibles’ positive traits of low weight, easy disposal, new materials and high-intensity graphics are offset by its negative aspects of lack of retail stackability, easy recyclability by consumers and a perceived slower fill-speed on the packaging line. Flex-pack technology drivers beneficial to retail and institutional food markets include lightweighting, sustainability, new films, pouching, microwaveable packaging, market timing, right-sized packaging, private labeling and concentrates. Some flex-pack market opps to keep in mind: 1) Will toys come in pouches? Think a “bag-o-Legos” vs. paperboard boxes. Resealable for storage, too. 2) Walmart wants to eliminate glass packaging in favor of standup pouches, but they must be recyclable. It’s still a problem. 3) Will Campbell’s debut a single-serve pouch for concentrated soup and kill the can? It’s more likely than not. My Thoughts: Obviously, the last few years have not been so good to flexible-packaging converters. The Great Recession caused a 13% drop in sales back in 2009, and it will be next year by the time sales recover to pre-downturn levels. Some of the FPA’s stats for the 2001-2011 period are also pretty telling. CAGRs have fallen from 4.7% back at the turn of the Millennium to only 2.7% last year, the number of converting companies is down from 660 to 405, and industry employment is down by 10,000 workers to 79,000 last year. How’s THAT for consolidation? On the plus side, though, average $$ sales per employee is up 47% (Yes, inflation did have some impact). Despite these negatives, US flex-pack makers are well-positioned to deal with a host of challenges ahead. If you’re a small player, find strength in serving niche markets. If you’re big enough, get into those emerging markets (geographically AND end-use product category) now. No matter where you stand sales-wise, promote the heck out of flex pack’s “green” traits vs. the competition. This entry was posted in flexible packaging, sustainability and tagged converting, flexible packaging, innovative packaging solutions, mergers & acquisitions, orville redenbacher popcorn, packaging, paper, plastic film, recycling, sealed air corp, source reduction, sustainability, The Great Recession, us gdp growth. Bookmark the permalink.